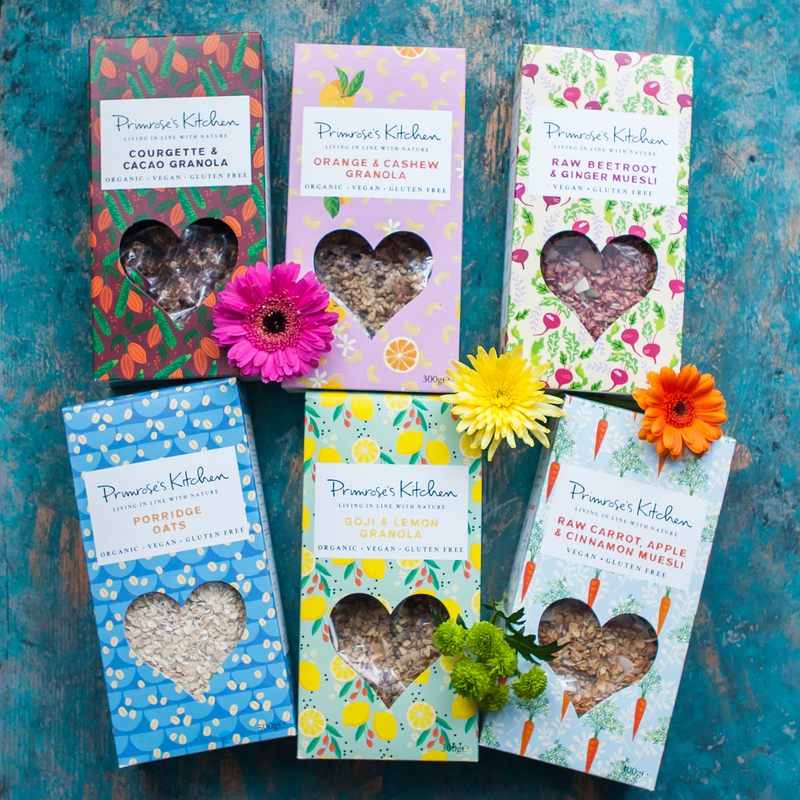 A delicious selection of Primrose’s Kitchen muesli, organic granola & organic oats & oatmeal. Serve with milk, dry as a snack or mixed with fresh fruit and yoghurt. Once opened roll inner bag down tightly and consume within a month. Yumbles is a good reliable company that delivers good quality clean eating food. What I love about them the most is that they use locally sourced food and caters for people who are on a paleo lifestyle. Excellent product. Expensive for what it is but truly delicious. Yumbles is a brilliant company . Great product and the delivery was really prompt. Great product and the delivery was really prompt. Will be a regular customer. I have recently eaten the brand new Kale and Cacao which is a lovely blend of Kale Cacao and Date Syrup - incredibly addictive breakfast and puts a smile on my body everyday. The innovative breakfast cereals made by Primrose's Kitchen include Cacao and Courgette Granola which is a lovely cluster of health and loveliness and innovative ingredients blending savoury and sweet - importantly I never get a sugar rush after eating these cereals they really are breakfast re-defined. Be great seeing these in mainstream supermarkets more widely - I am a fan for life - Primrose's Kitchen have become one of my regulars for my healthy eating what will always be in my cupboard. Customer service is also very friendly. I have suffered with Chronic Fatigue/M. I have suffered with Chronic Fatigue/M.E for around 3 decades and i also live with Complex-Post-Traumatic Stress disorder so for me eating healthy is vitally important and Primrose kitchen is highly recommended - the swift delivery was hugely impressive and the box so nice i have kept it. 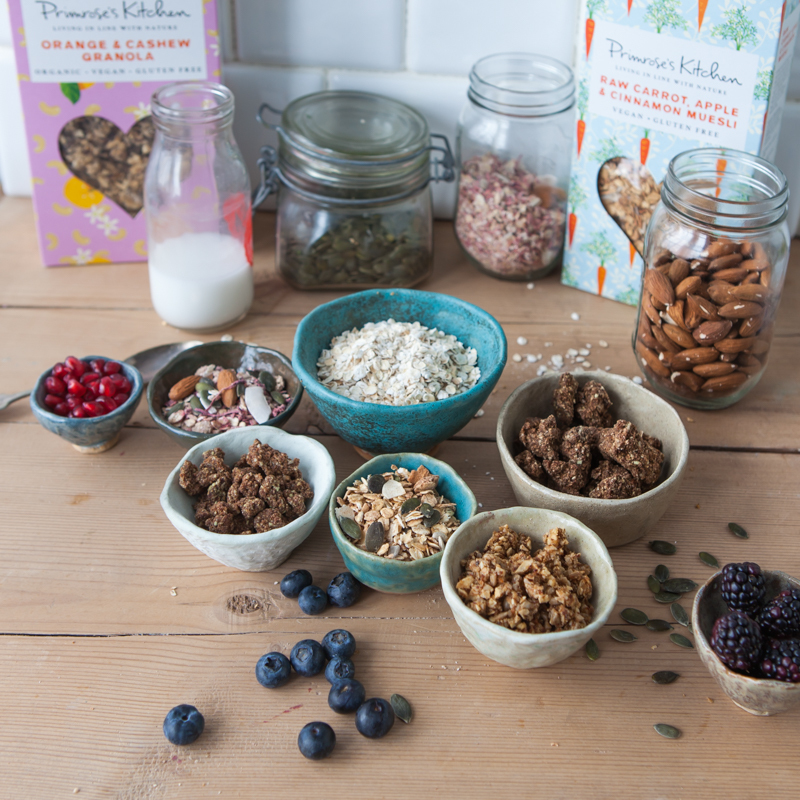 In my food cupboard is stocked with a wide range of healthy eating and I noticed yesterday how pretty Primrose Kitchen' Granola/Muesli boxes are designed when just glancing at them in my cupboard. From getting the delivery I have eaten one of each and they are beautiful creations in taste vibrancy and putting a smile on mind/body first thing in the morning and importantly being healthy all the granola and muesli is very tasty and versatile because you can put them in smoothies and on top of a smoothie also - I really like them and will purchase again in future. Gluten free, vegan friendly, healthy food madein the heart of Dorset following the naturopathic principles.